Halloween is upon us and that usually means the weather is getting cooler (at least in this neck of the woods…Southern Illinois) and cooler weather means it’s time to start breaking out the greyhound coats and other gear to help our greyhounds stay warm and dry. You may be saying, “I have had lots of dogs and I never put coats and things like that on them and they did just fine”. That may be true, but greyhounds are not “regular dogs”, they have less fat to insulate them from temperature extremes and they also have very thin, light fur compared to other dogs, even other canines with short fur. As stated above, they have virtually no fat to insulate them, no undercoat in their fur, so give them a break and get them a coat for the upcoming winter months. The breed, however, can vary in their sensitivity to temperature changes and coats made to fit your hound will ensure your dog is able to cope. A good warm, waterproof winter coat is an absolute must have. To deny such a sensitive dog this basic item is cruel and granted your dog may not freeze to death when outside for short periods, but it will nevertheless be very uncomfortable without the appropriate attire. Don’t be the one that’s seen out running around dragging your poor shivering greyhound(s) around in the dead of winter with no protection from the cold. One of the very first things that you may notice about a retired racing Greyhound is that they have tattoos in their ears. This is done to make sure that every dog is easily identifiable and the correct dogs are entered into races. The left ear will show his litter number and the right ear will show his date of birth and then you will see a letter such as A, B, C etc…this letter relates to the order in which he or she was born in the litter, ie…A is the first born and so on. 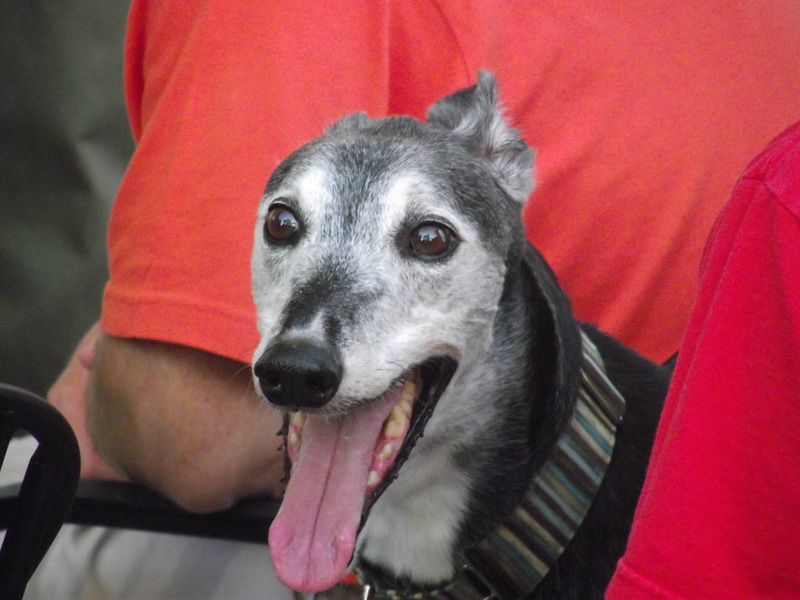 When someone adopts a Greyhound that has been retired from racing, there will be many “firsts”. Almost everyone of these dogs have never seen stairs, glass doors, carpet, mirrors, televisions and so much more. The new owner should slowly start to introduce the dog to every aspect of the home, to include everyday items and objects that most dogs would already be accustomed to. This should be done in a calm, relaxed manner and to help do this, just imagine a time when you were in a situation where you were in unfamiliar territory and how stressful it was, that should hopefully help you to have some empathy to the new arrivals initial fears. Another thing that many owners report is that the dog is prone to running straight into glass sliding doors, since most of them have never seen windows, place some masking or other darker colored tape at the eye level of the dog on the glass and that should help and prevent a potential catastrophe. Baths only need to be given once every couple months or so since greys will often groom themselves like cats and so the short coat remains fairly clean and the Greyhound rarely, if ever, emits a doggie odor, in part because of what was just said and also because of a lack of oil in the dogs coat. Brushing only needs to be done once or twice a week as greys shed less than most other breeds. A soft brush or “hounds glove” works best. Ears should be cleaned one time a week or so with clean cotton balls dipped in a solution of 50% water and 50% rubbing alcohol. 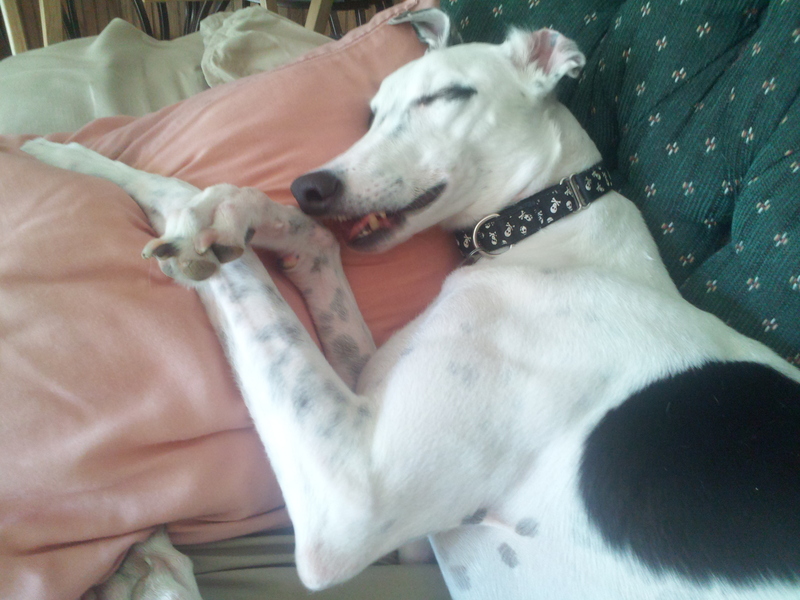 Taking care of their teeth is one of the most important things you can do for your greyhound. You should brush their teeth each day for a few minutes using a soft toothbrush and canine toothpaste. Yearly examinations should be done by a vet. Nails probably should be trimmed at least one time a month. Greys are sensitive to insecticides and if you apply these to your lawn, you will need to keep the dog away from that area, you also need a vet who is familiar with greyhounds as there are many things that you can give to other dogs that cannot be given to greyhounds. They have the lowest percentage of body fat of any canine and for this reason they do not fare well in extreme hot or cold weather and are strictly indoor pets. Because of the above mentioned fact, many will need a sweater on cooler or cold days to maintain core body temperature. While they thrive with outdoor exercise, this is an indoor dog that should live and sleep inside. A greyhounds neck is larger than their head and because of this a regular dog collar can easily slip off or the grey can “back out of it”. It is recommended to use a Martingale type dog collar (it is made with an extra loop that tightens it a little when pulled on) in order to help prevent a dog from slipping out of the collar and running off (you WILL NOT be able to catch him or her if that happens!). A few greyhounds display something called “Sleep Aggression”…a normally very friendly or even timid dog can snip, snarl or bite if disturbed from sleep. Adults should be careful and children must be taught about this early on. However, when awake, they love to be as close to people as possible, but many do need a small amount of time each day to “get away’ and relax. You should devote a corner in a quiet room or other area where the dog is free to come and go….place a comfortable doggie bed in that area or some blankets where they will have adequate padding to rest in comfort. Your new greyhound will never cease to keep you entertained! The expressions on their faces at times are ridiculously cute. In addition to being one of the world’s fastest accelerating land animals (2nd only to the cheetah), greyhounds can go from completely still to completely insane in 0.02 seconds and it’s these playful, hyper bursts of energy which make them so endearing, but before you know it, they’ve fallen off to sleep again! Unlike almost all other pure-bred dogs, greyhounds don’t suffer the disastrous consequences of inbreeding. This is because they have been (& still are) bred for functionality & not form. In closing, next time you hear someone mentioning greyhounds, please, please, please… take a minute to give a thought to the wonderful sweet pets that greyhounds make and look into the possibility of making one of these “greyt” dogs a member of your family.